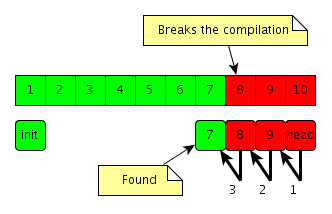 The purpose of the command is trackdown the state of the repository when given test command succeed. Usually it is looking for last compilable state or for state when some unit test has been passing. 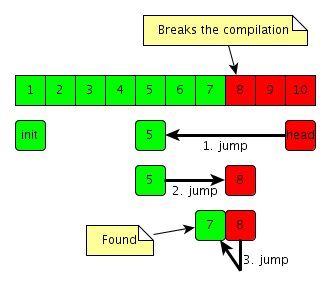 Without any flag, the command run a given test (or if none give, the test defined by setpref) on the last recorded version of the repository, and outputs whether the test has been successful or not. With the --linear flag, the command looks for the last state of the repository when the test has been passing. The --bisect flag is also a tracking-down option and has advantages but also disadvantages. Text should help user understand when to use –linear and when to use –bisect. --backoff is similar to --bisect and may be faster on bigger repositories. Example: darcs test --linear "cabal configure && cabal build"
For an up-to-date and detailed explanation see darcs help test. The behavior is simple, it unpulls the patches until test succeed. Note: Each number is patch. 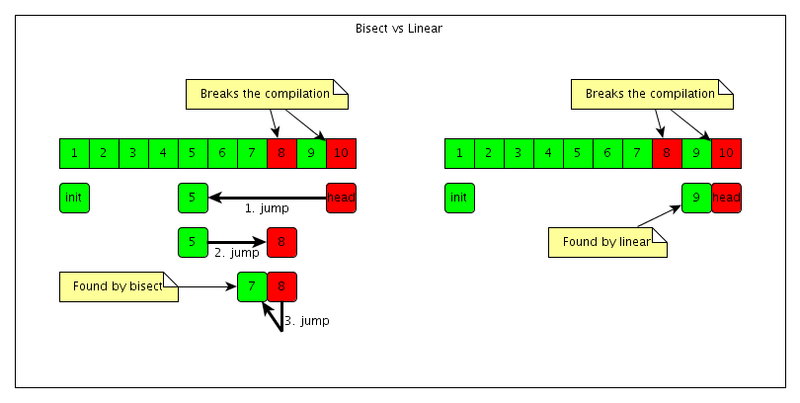 With --bisect option the trackdown searches using bisect algorithm. It starts from the half of repository and jumps next into left or right half depending on test result. --backoff is aimed at finding regressions which are closer to the head than to the middle of the repository. It will perform relatively better on repositories with more patches. Example: on darcs’s repository, it performs between 30 and 70% faster than bisect. The search strategy starts by unapplying 4 patches (chosen to match the break-even point with linear search). If the test fails, it unapplies 8 more patches and tests again. On each test failure, it removes twice the number of patches as before. Once the test passes, it bisects the patches it just skipped. When the command fails for whole history it will be found after tracking down the complete history. Jump into half is basically pull or unpull half of the patches depending on the half. Jump has O(n/2) complexity and not O(1). If there are more states of the repository where command start and stop working than there is not guarantee which is in result.